Reading the Bible is a discipline that many find hard to do. Those who do get into a routine of reading every day can easily fall into a rut where one is reading the text but it’s not impacting them any more than if they were reading a novel. 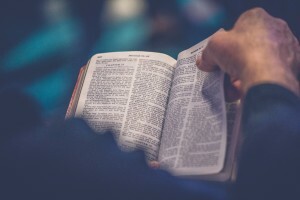 I find myself going through this as well so I wrote down some suggestions that can help us all to get more out of our Bible reading. Highlight commands. Years ago, a pastor said that he puts a “C” in front of every command he comes across in the Bible. I started to do that in one of my Bibles but lately I have started underlining commands that jump out at me. This can be anything from words of Jesus to instructions from Paul to the churches which could still be applied today. If you already underline verses in your Bible, then you may want to do the “C” method. Regardless of how you do it, I think it’s good to pay attention to the things that Scripture commands us to do, how to act, etc. Slow down whenever God or Jesus asks a question. My brother has written a couple books titled Questions God Asks and Questions Jesus Asks. These books have helped me to read the Bible in a new way. If we truly believe that everything is in the Bible for a reason, then we should take the time to figure out what God is speaking to us through even the simplest things. It may look like God is asking Abraham a question, for example, but is there something in that question that we can learn from today? Mark verses you want to be able to find quickly. I know there are some who believe we shouldn’t mark up our Bibles and, if that is your conviction, that is fine. For myself, however, underlining verses that I especially want to remember is very helpful in finding them again. I have a hard time memorizing references but I can sometimes remember the book a Scripture is in, and this saves me a lot of time. Don’t read when tired. This is something I am working on. I like to have my prayer and Bible time the first thing in the morning but if I push myself before I’m really awake, I end up barely getting through a chapter before I’m falling back to sleep, and I don’t comprehend what I read. I also like to go through a Bible study at night which means making time to do that before I’m too tired. On the evenings that I play out early, I may review the previous evening’s study but I don’t try to do a new lesson if I don’t have the mental energy to put into it. If you find that this is your experience every morning and/or evening, then you will have to find a time that you can devote to reading. The answer isn’t to ignore the Bible but to find a way to get the most out of it. Pray. Take time to pray before you read. I often pray that God will open my heart to receive His Word and know what He desires to speak to me, that He will give me ears to hear and a willingness to obey. I usually have a time of praise first as well which can help to prepare me to read the Word. Let’s all endeavor to not just be hearers of the Word but doers as well. If you have found something that has helped you to get more out of your Bible study, feel free to leave a comment. I would love to hear from you. Great post! I have found that for me it is easier if I have a reading plan and stick to it. A few years back I found a reading plan on the internet that I still use that allows me to read the entire bible in a year. A reading plan works better for me because it is usually only two to four chapters per day, depending on the length of the chapters. That allows me to take my time and sometimes to even read the daily chapters more than once. Before I started using a reading plan, I would sometimes go through an entire book of the bible in one sitting. Obviously, I didn’t get much out of doing it that way. Sure, I could claim that I read the entire bible but it wasn’t really helpful for me. Having a reading plan is helpful. I also use a study bible when I do my daily reading. The notes and references are very helpful in explaining the meaning of certain passages. They also give you other passages to read that can further help with your understanding. I have learned that reading and studying scripture is a life-long process. I can read the same passage several times and learn something new each time. That is one of the things I love about God’s word!